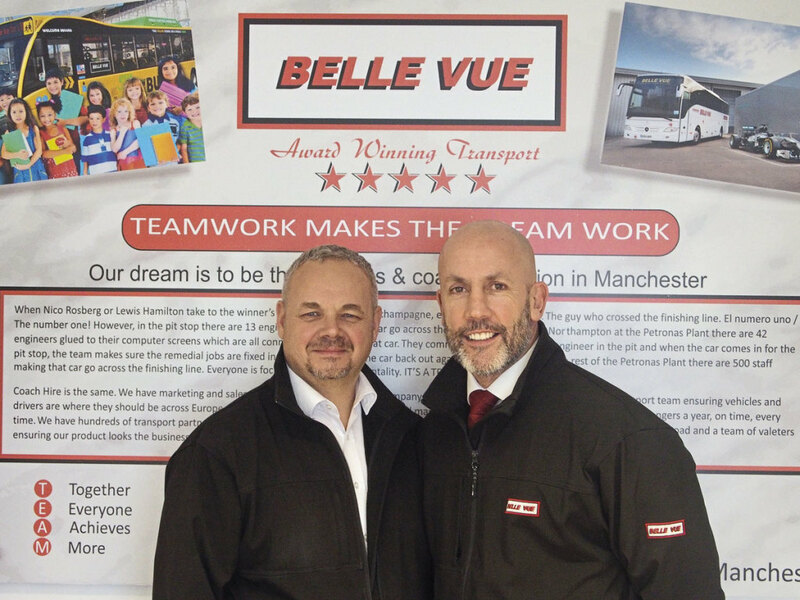 What makes Belle Vue Manchester one of North West England’s top operators? When Philip Hitchen, Director of Belle Vue Manchester, walks into his office, it is clear he has plenty of enthusiasm for his work. The company is considered one of North West England’s top operators. “It was that personal service we provided,” Ian added. The operator focused on being a business that serves its local community. Its taxi side prospered, prompting it to buy new cars. It got into providing services to the BBC, with Phil saying he has transported famous TV personalities, such as mahogany-tanned antiques expert David Dickinson. 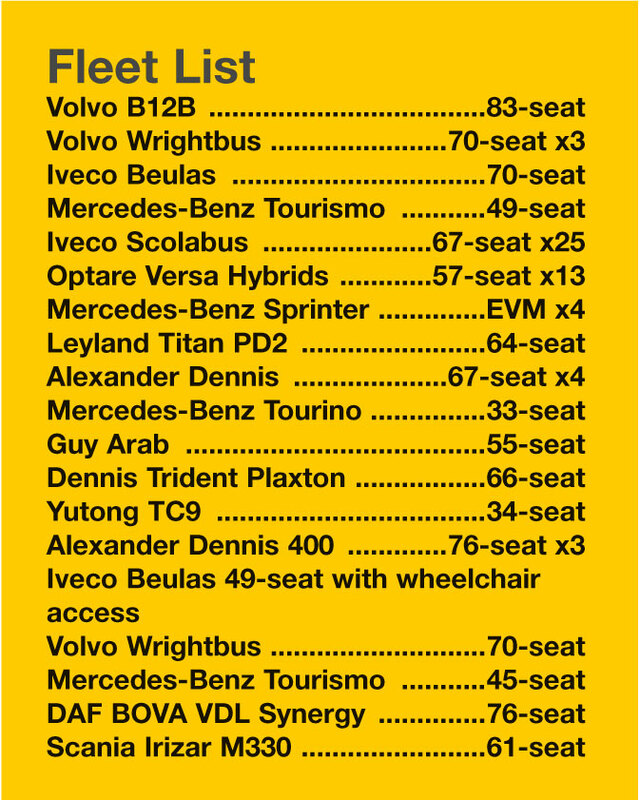 Today, Belle Vue operates a 50-strong fleet of yellow school buses. They make up the majority of its fleet of 66. It employs 90 staff and carries a million passengers a year across its operations. Its services are wide-ranging, with a variety of private hire options offered on its website, which can be customised to customers’ needs. Its vehicles for hire include not only its modern fleet but a range of heritage vehicles too; the company employs Kenny Walsh, a prolific restorer of old vehicles of all kinds (more on Kenny and his work later in this article). Weddings and proms prove popular and it has hired vehicles for election campaigns. You may have seen one of its vehicles in a recent Tombola bingo company TV advert. 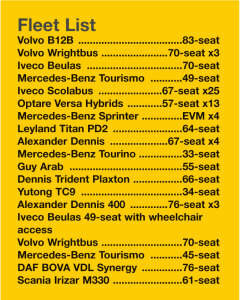 Belle Vue has also bought a 61-seat Irizar i6. These buys were part of a £700,000 investment it has made over the past two years, with the latest batch of vehicles representing a spend of £383,000. Philip said: “Increased demand for vehicles which can accommodate larger groups has dictated the need to buy a bigger coach than the traditional 49-seater. The minibuses are equipped to a very high standard and perfectly meet the needs of our contract customers and touring groups. Belle Vue’s orginal minibuses were LDV Convoys. 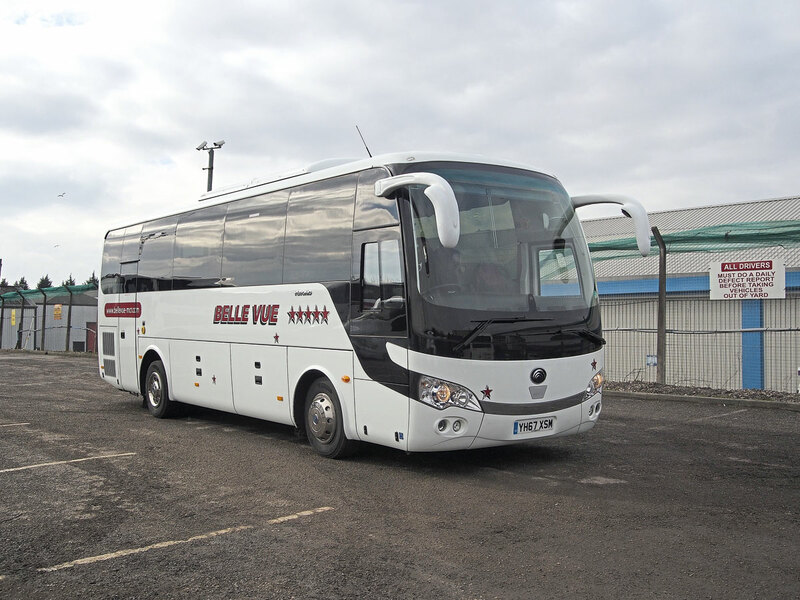 Belle Vue did a lot of private hire in the early days and, for coaches, started with Volvos. Today, the services tend to be more contract-based. For school services, it has some Optare Versa hybrids and 25 Iveco Scolabus vehicles. Philip continued: “In 2010, I was in New York visiting a friend. We went shopping at a giant hypermarket, not something like Asda or Tesco. It was going into a farmhouse in terms of the décor; it was an amazing shopping experience. All of the staff there were really engaged, with big smiles. We got to sample food on sale. They had puppet shows for the kids, so the mother and father can be better engaged to make a sale. At the tills, there was a member of staff who took the food out of the trolley for you, and all the customer had to do was pay. I was so impressed by the organisation. I’ve never seen staff engagement so high. During my stay, I learned what it was about; they rewarded staff with praise and affection. This prompted Philip to roll out iMA training. This is all about communication; it begins by identifying how a person wants to receive information and then teaches the learner how to change a message in a way that is most likely to be understood. Speaking on the same wavelength as the recipient should help communication and therefore increase levels of trust and co-operation in the workplace. After coming back to the business and implementing changes such as this, Philip said that in three months he had doubled the size of the company. Benefits of using this system include not only being able to see where its vehicles are, but allowing it to control engine idling and improve driver performance. Being able to see how drivers are cornering and accelerating and other aspects of their performance allows the company to inform staff how they can improve their driving. According to Philip, the tracking also leads to savings of up to 12% in fuel. For regular clients, Traffilog offers access codes so they can track vehicles they have hired. The system also allows Belle Vue to pay drivers who deserve better salaries with performance bonuses. Phil said: “We have got great people, from the top to the bottom.” “That’s right, from the cleaners right through to the managers,” added Ian. Philip mused: “We are living in changing times. You can have a 14-year-old girl become a multi-millionaire just by sitting at her computer on the internet. It’s easy to get a business going now. Things have changed massively with technology. Considering this drive for excellence, he said: “Another string to our bow is our focus on auditing. We spend a lot of money for auditors to come in. “I used to play a lot of football and do a lot of martial arts when I was younger and, through that, I noticed that my coach often got more out of me. If I was trying to do 100 repetitions, psychologically I would think I’ve got eight more to go when I was at 92. But at 95, the coach would say 15 more to go, and you would do those few more. I thought, wouldn’t it be fantastic if we got that with the business. To help bring the best out of its drivers, Belle Vue offers £300 of prizes to the best performers on the road as determined by its telematics package. The company frequently gets ‘thank you’ letters and it hands out £50 to the driver who attracts the best letter of the month. Another £40 is up for grabs based on their general performance; things like walk round checks and attendance. Philip added: “What is it they say? The grandfather starts it, the son wrecks it and the grandson kills it. For me, I think some people treat it as a hobby not a business. I don’t think people push the barriers in this industry. If you stand where you are, you will get overtaken. “Also, when you look up and down the country, you see there are a lot of family businesses, with something like ten to 40 vehicles. They’re really passionate, but their work/life balance is compromised. “A lot of directors in this industry are too hands on, so they can only do so much in a week. They get to their 40s and 50s and they die from burn-out. “I started working from home; I wanted to be working on the business instead of in it. When you’re in the office, you can spend a couple of hours in the morning just firefighting, sorting the daily problems out. You have to get your priorities right. Ian here oversees the general operational aspects on a daily basis. Working from home enables Philip to focus on developing the business. One way it has done this is by greater use of social media. Digital interaction does not end there though. 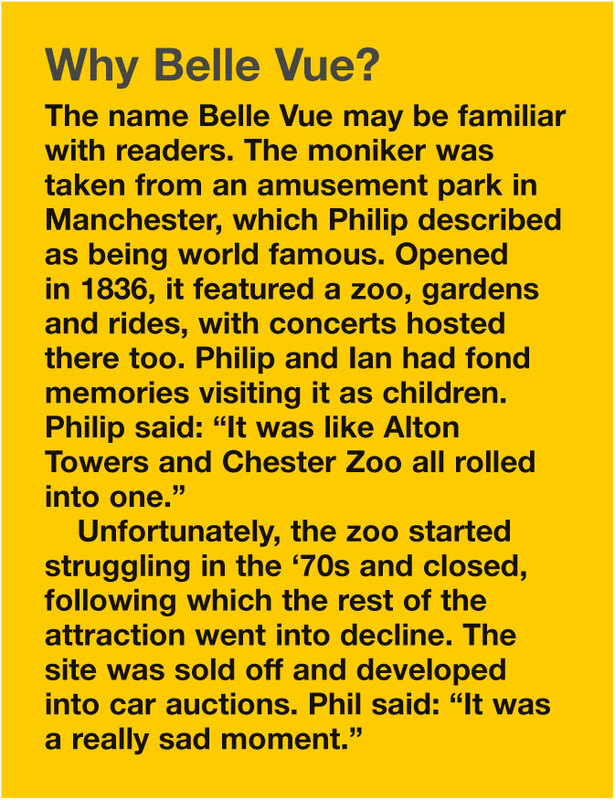 Belle Vue sends emails to make sales now and Philip writes a lot of blogs that not only focuses on his company, but looks at what is going on around Manchester. 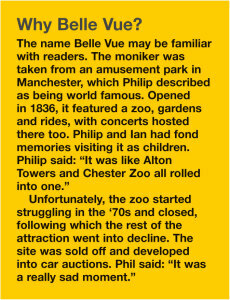 But what makes Belle Vue such a success? “It’s about having the right attitude,” said Ian. Walking round the depot, it is clear Philip’s staff have all bought into the plan at Belle Vue. They are reminded of the high standards they must meet with the mission statements emblazoned across the walls.